Abstract: Mental health disorders are becoming increasingly prevalent and it is important that dental professionals have adequate knowledge of these conditions, the impact that they may have on oral health and how they should be managed. 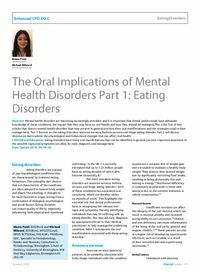 This is the first of two articles that discuss mental health disorders that may present in general practice, their oral manifestations and the strategies used in their management. Part 1 focuses on the eating disorders: anorexia nervosa, bulimia nervosa and binge eating disorder. Part 2 will discuss depression and explores the physiological and behavioural changes that can affect oral health. Clinical relevance: Eating disorders have many oral manifestations that can be identified in general practice. Improved awareness of the possible signs and symptoms can allow for early diagnosis and management. Author notes: Nisma Patel, BDS(Birm) and Michael Milward, BDS(Birm), MFGDP(Lond), MFDS RCPS(Glas), FHEA(UK), PhD(Birm), GDC, Specialist in Periodontology, Reader and Honorary Consultant in Periodontology, Birmingham School of Dentistry, University of Birmingham, Mill Pool Way, Edgbaston, Birmingham B5 7EG, UK. Objective: To understand the eating disorders anorexia nervosa, bulimia nervosa and binge eating.